As I promised earlier this week, I’ll be dedicating today’s post to the food diary. In your weight loss journey what you eat is 80% of it. If you don’t write it all down, you might be fooling yourself into thinking that you’re eating less during the day than you actually are. 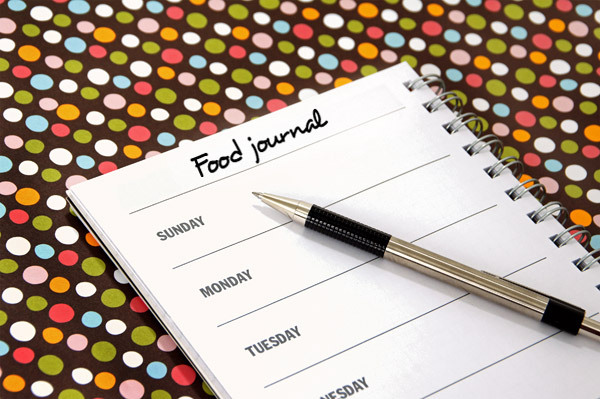 The way to avoid that pitfall is to create a food diary. There are two “types” of food diaries that I typically talk about when I talk about food diaries. The beginner and the beast! I’ll talk about both options, as well as some great online/mobile options that have been popping up over the last year or so. A food diary at it’s most basic form is simply a list of all the food that you ate over the course of the day. It can be kept on an excel sheet, in your phone or a little notebook that you carry with you. Every morsel that passes your lips MUST go down in the diary (or journal if that sounds less girly to you!). 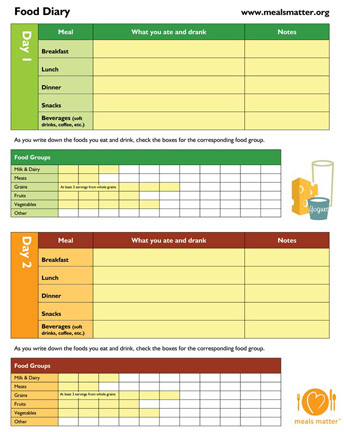 When you’re first beginning a food diary, keep it simple. Write down what you ate and approximately how much you ate (1/2 an apple, three scoops of ice cream). The key here is to be honest about the size and amount. Most people underestimate how much of one thing they’re eating. So play it safe and overestimate! This your basic food diary. Stick with it until you feel more comfortable, then switch up to a “big daddy” version of a food diary. This is where diaries get fun. Now that you’re used to writing down every piece of food that you eat, now is the time to add more details. I recommend breaking your day into Breakfast, Morning Snack, Lunch, Afternoon Snack, Dinner, and Anytime. Now when you eat at one of those predetermined times, write down the time and your hunger level on a scale of 1-5, 1 being I’m still stuffed from my last meal and 5 is “I’ve been in the desert for three days and I’m STARVING!! !” As a rule of thumb you should never be eating at any of those extremes. In theory you should be eating before you get to the starving place, but you shouldn’t be eating out of boredom. It’s particularly important to note that you should also be noting if you’re upset or bored, etc. Remember this is YOUR diary, no one is going to see it but you, so don’t be embarrassed if you at that pint of Ben & Jerry’s because your boyfriend just dumped you. Because no one will see it but you. But if you’re an emotional eater, you’ll begin to see patterns and learn how to cope with your feelings/issues without eating. But I’ve digressed, anyways, you also what to get more specific about how much. Buy a food scale if you have the extra cash, they’re well worth the investment. If you don’t want to, that’s fine (it does take extra work), but try to be as precise as you can. Also begin to write down the caloric content of eat of your pieces of food, as well as meal and daily totals. This will give you a good idea of where/when you’re calories are coming from. You’ll also get to see if you’re meeting or exceeding your recommended caloric intake. It’s important to not fall too below your recommended intake either, because that will slow down your metabolism. Congratulations, you reached your first week of diary keeping (or big daddy keeping!). Now you need to go back and look at what you ate over the past week. Look for places where you could’ve cut out sweets or were eating because you were bored. A food diary will allow you to see a record that can’t be argued with. It will also allow you to set food goals for the next week. Like, I’ll have dessert 4 times this week instead of 5. It also gives you something to be proud of when you reach those goals! Also, decide on rewards (non food related) if you reach your longer term goals (like eating at my caloric intake for 1 month) like a book you’ve been wanting to buy or tickets to an event you’ve been dying to see. These shorter (and obtainable) goals will incentivize you to continue on towards the larger goal of a healthier you! I love the mobile option that has emerged in the last few years. Thanks to smartphones, you can now log your food intake on the go! My favorite is Lose It! It’s a fabulous site that has both a mobile app and you can use it on the web. Plus if you have a FitBit, you can link the two accounts and Lose It! recalculates what you can eat and still lose weight based on activity! Check both products out! Lose It! is free and the FitBit device costs $99, but the online software is free (and it too has a mobile app). So bottom line here is log your food for successful weight loss! Ticking off local races one medal at a time. Dedicated to giving you the truth about weight loss. Bringing New England to the table!